You can easily increase or decrease the exposure for a selected cell range. In the Timeline or Xsheet view, select the cell range on which you want to set the exposure. Select Animation > Cell > Set Exposure to > Set Exposure to 1, 2, 3, or Set Exposure. In the Timeline toolbar, click one of the Set Exposure buttons. Note that you may have to add this button to your toolbar by right-clicking on it and selecting Customize. In the Xsheet view, right-click and select Exposure > Set Exposure to > Set Exposure to 1, 2, or 3, or Set Exposure. If you chose the Set Exposure option, the Set Exposure dialog box opens. 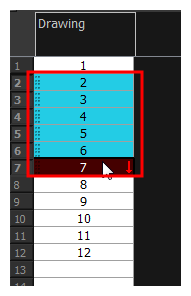 Enter the number of frames you want the drawings to display and click OK. The new timing is displayed in the Xsheet view.